Last week in Riverhead, Long Island. A few pictures from work...enjoy! A few weeks ago I came across an offering on ebay for a number of Walthers (TM) twin hoppers decorated for the DL&W. From the enlargement they looked spot on and were advertized as a special run by Accurate Finishing, Inc of Elburn, IL. I must have missed these when I was in my house designing and building period. Were any of you aware of them? In any case, I ordered 2. When they arrived I put them on the "To Do" shelf and figured I'd correctly detail them as a rainy day project. This past week provided a number of such days and I needed them all. I pulled out the two I had previously done for the article, the article itself and, referring to them for accuracy in detailing, I got to work. The article appeared in the June-July issue of Prototype Modeler when Jim Six and Mike Schafer were editing. In rereading it I think it still holds up well. 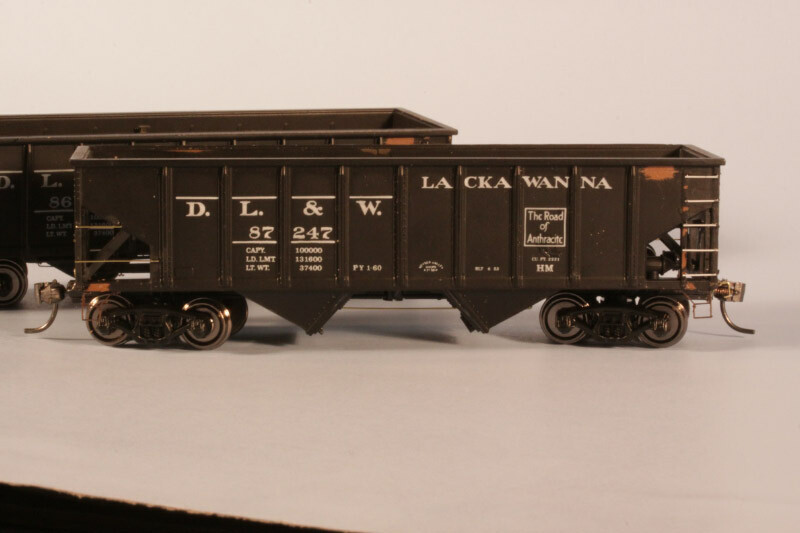 The DL&W cars were built in two 500 car series by ACF. The fellow from Accurate Finishing may have read my piece since one of the cars I received was numbered 87247. This matched in every way the Warren Garrick prototype photo Paul Gnash and Bob Fischer provided to me. The basic model from Walthers (TM) is a PS-3 but comes close to the ACF cars. It's certainly the best starting point on the market that I'm aware of. There was a bit of subtracting, adding and detailing to be done but, that accurate lettering was easy to preserve. 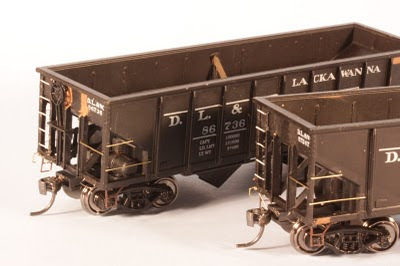 The only part I cheaped out on, that I did on the models built in the 80's, was to skip drilling out and adding all the drop steps. My OCD is as much a factor in my modeling as ever but, how many get to even this point now days? From the pictures you can see most of the changes made to the model and what it will look like finished. Hopefully there's something here for all of you. 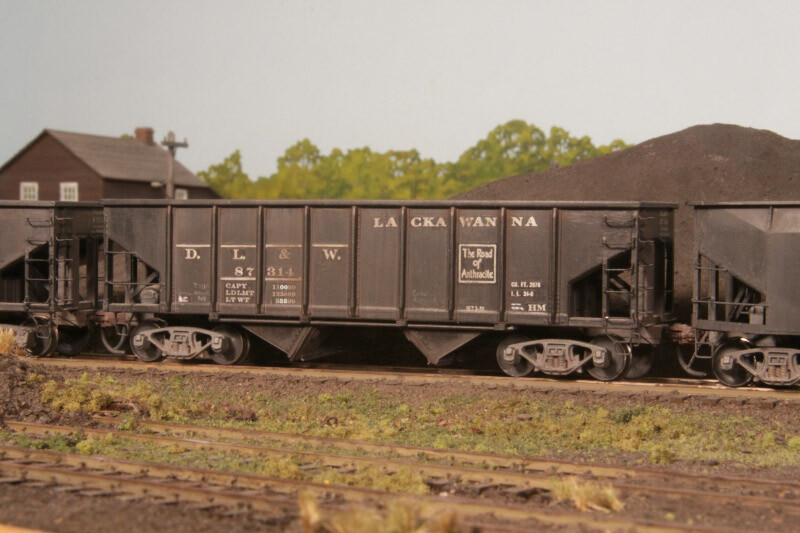 There are now legions of modelers going to this extent with detail thanks to that "Band of Brothers" that got the Prototype Modeling approach going in the late 70's and early 80's Maybe you'll recognize a few names on the contacts list? Acting on a tip received earlier in the night from Frank Jolin, I visited the D&H in Port Henry, NY 'round midnight last night. 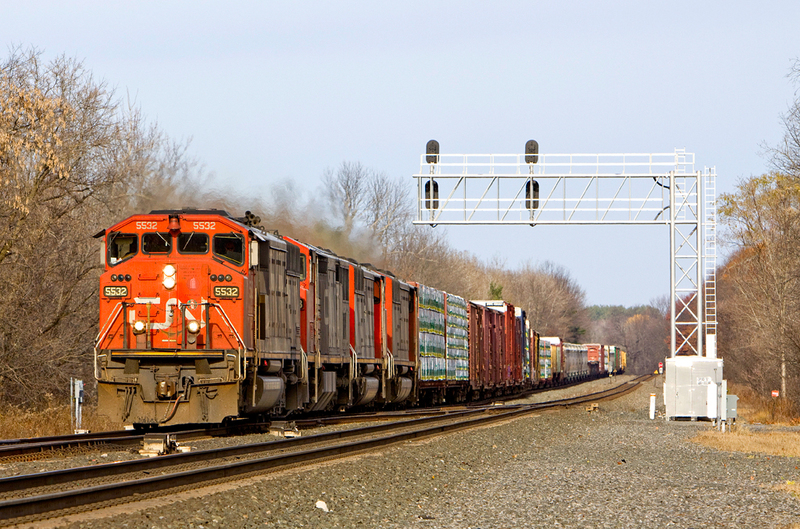 252 had the CEFX 1019 for a leader! It was forecast to be a superb night weatherwise for night photos, and while the promised heavy rains had not materialized yet, it was unusually warm for the middle of November. 252 was running behind 930 tonight, that much I knew, and while I had been away for a couple hours on the NECR after the pair of trains arrived in Rouses Point for their crew changes, I figured both trains had enough time to be out on the road by the time I arrived in Port Henry. Crossing Lake Champlain at nearby Crown Point via the free carferry it started to rain, and by the time I jumped out of the civic to setup in Port Henry it had turned into a steady downpour! Conditions don't get much better than this for night photos! Seeing the potential for another fine result here, with Mother Natures contribution tipping the scales my way, I setup the lights around the scene, keeping an ear open for 930 coming south. Little did I know at the time, I had merrily painted myself into corner tonight, assumming 252 would be following 930, a common practice. Please take note, as I did, the newly installed handicap access platform in the photo. They did good! Not obscurring the view of the building! I was impressed. Out of sight to the left of the scene is a shack holding a ramp perhaps? I'm not out of the woods yet though here, as I note the "yet to be installed" light posts. I'm hoping the round cement foundations with heavy copper wire emerging are not for tall posts with flourescent lights. I'll see what they are planned for soon enough, I can wait. Ha,ha,ha! The rain continues and as I finish with the lights, the car scanner picks up 930 hitting the talking detector twenty minutes away up at "Howards" passing siding. Disappointed, knowing 930 has an NS unit leading again tonight, I decide to make a "test shot" of 930 to check the lighting, then wait for the following 252 to shoot the "money shot". In hindsight, this decision saved the night in my case, with its gorgeous weather contributing to a night photo. 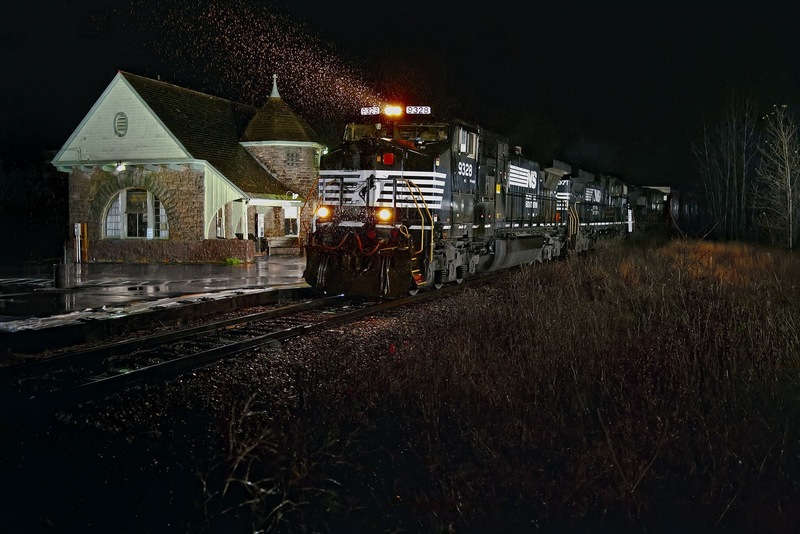 Seriously, for me, the only weather better than this for shooting trains at night is when it rains in winter with snow on the ground. Each flash unit and its Pocket Wizard transceiver are inside a zip lock freezer bag, safe from the rain. The last item to emerge from the car is the most important, the camera bag, transported under the black umbrella to the stepladder. Some twenty three minutes after they passed the detector at "Howards", headlight glow backlights the hillside the rails go around above me here, and 930 slowly swings round the curve, cruising past the station and my flash. The rain showing up well in the headlights. Surprisingly, the black and white NS power looks pretty good in tonights photo! Not a thing needs to be changed in the lighting, I've had plenty of practice setting up here! And I wait and wait for 252, enjoying being out in the rain but dry, until it becomes obvious, with a meet between 930 and northbound 253 setup for Fort Ticonderoga just to my south, that 252 ain't coming by until 253 goes past me northbound. So I return to the civic to pour the last of the green tea, camera and its bag safe beside me, while 253 closes in from the south,and then....... "someone" near the West Chazy tower tones in the dispatcher! 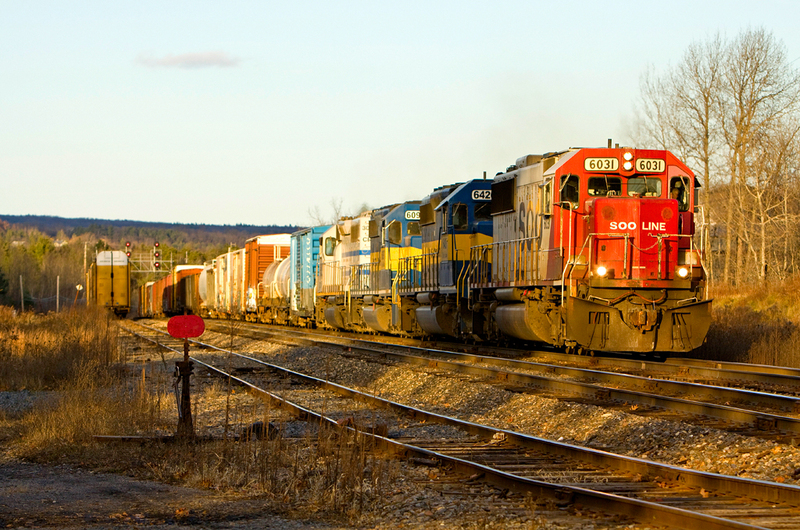 Trains moving around Rouses Point use this tower exclusively. I stare out the window at the near perfect conditions, the flash units waiting, grimacing, thinking to myself...........who could this be? Ha,ha,ha! I conclude, listening to the bits and pieces of the conversation I monitor, its indeed 252 with the CEFX leader, the crew is just now on board and ready to depart! With work enroute, they are at least three hours away, well into drab overcast daylight by the time they pass my location here later this morning. Now I dig the camera out from its bag again, inspect the nights photo.........yup, the NS power looks "pretty good" now, the station looks great, with help from Mother Nature! 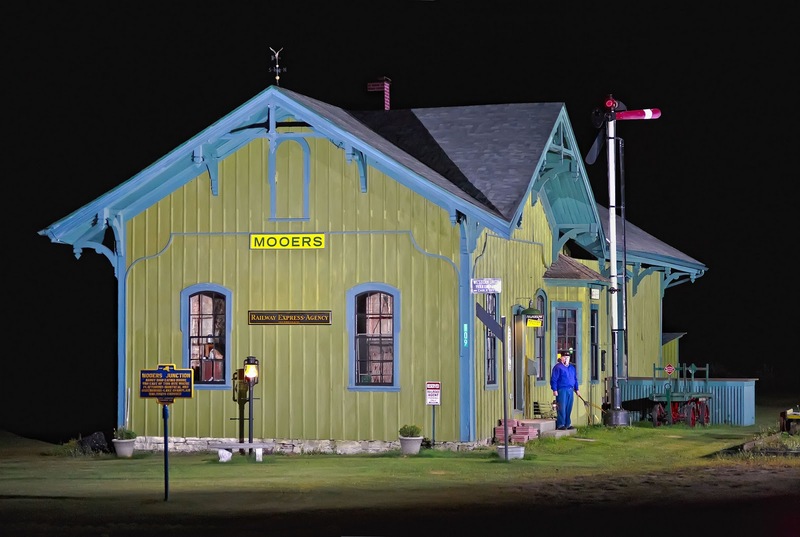 Shot on November 17, 2010 at 03:28 in Port Henry, NY with the 5D and Zeiss ZF 35/2 (Nikon) lens set at f2. Please enjoy! Comments are welcomed. 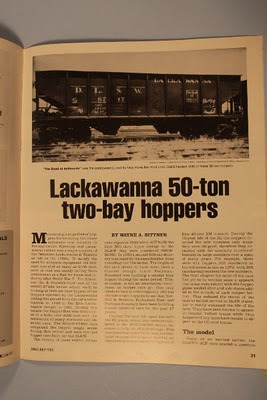 These are a progression of construction of the tunnel on my Kayaderosseras & Southern Adirondack Railway. The first photo shows the deck as the end of track. Second photo just after excavation and the first two 4X4's installed for the portal. Five wall panels complete with many more to go. 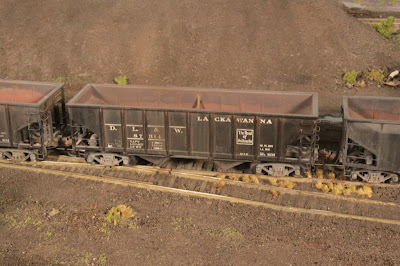 The latest shot with track started and the retaining wall finished. Some backfilling has been done and stone fill between the track and tunnel walls. Fall Foliage this year was hit and miss. Usually it seems the Swampy areas are the first to turn with dramatic colors. They are also the first trees to lose there foliage too as is seen in these two images. When these two images were taken most of are area was just starting to turn. Now everything is just about gone except for the trees around my house which I wish would drop so I can do a final clean up. Anyways here are two pics. One was taken on a Saturday October 2nd With Steve and Mike and the other was on Sunday the 3rd With Bill and Mike. Last night was something else! FIVE photos in one night! 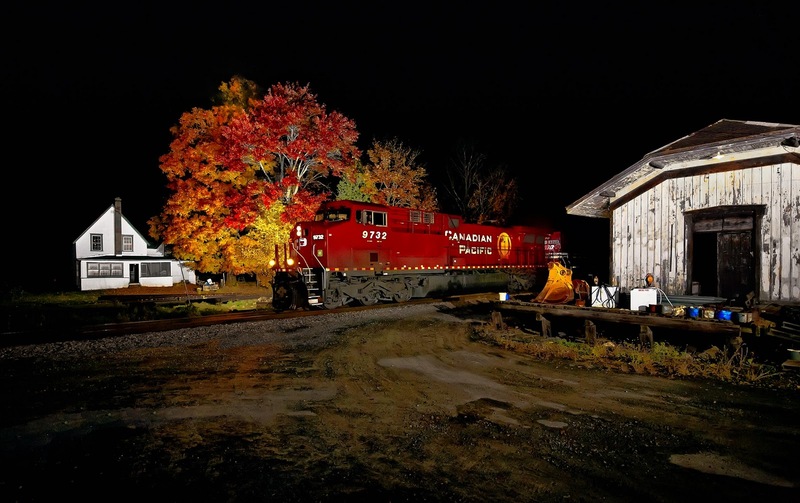 WHile it's not unusual on my travels along CSX, up here in the North Country I don't usually get that many chances during one night out, LOL! HEading out from the compound with the intent of capturing a shot of Ethanol train 642, which spent the better part of the day sitting up in Rouses Point, due to a late delivery from Montreal and a track block in Saratoga, I drove north up I89. During the hour and a half drive, 252 and 930 arrived in Rouses Point as well! I went through town with all three trains still waiting for U.S. crews to appear. With breakfast in the car with me in the form of a thermos filled with soup, alongside the usual thermos of tea, I made a quick stop at a 24 hr. grocery store for a bite to eat, then headed for Plattsburgh. I was well aware how the night was shaping up.......the soup might not get consumed until later. While I shot some new angles around the Plattsburgh station, the best shot of the night came after 642 passed by. Learning via the car scanner the trailing unit SOO 6060 was low on water, they picked up a unit off 253 which met 642 at Rockland. 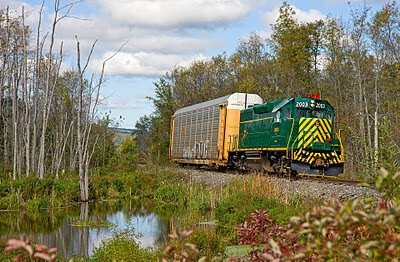 WHile they were performing the moves to pick up the third engine, I drove south from Plattsburgh around 642, arriving at Willsboro. 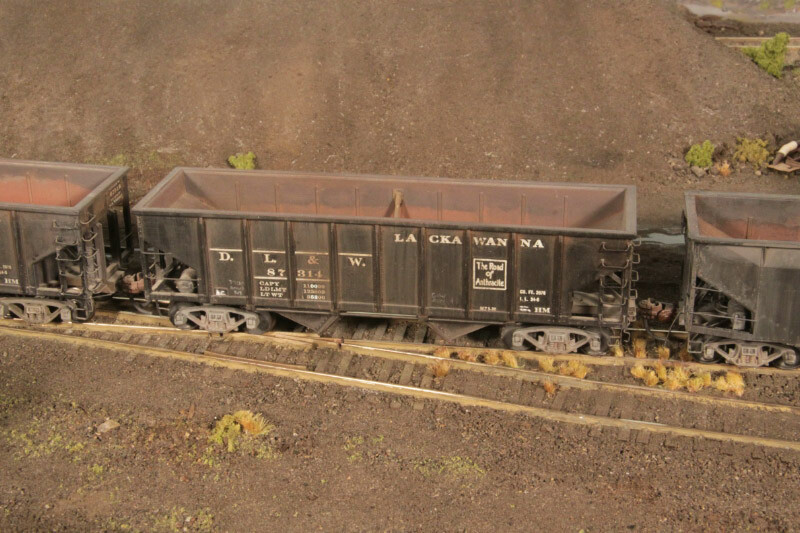 Driving in down the dirt road leading to the old station and newer modular M.O.W. headquarters, I took one look, and knew I had made a good choice visiting Willsboro! The background trees foliage was glowing in the dark! 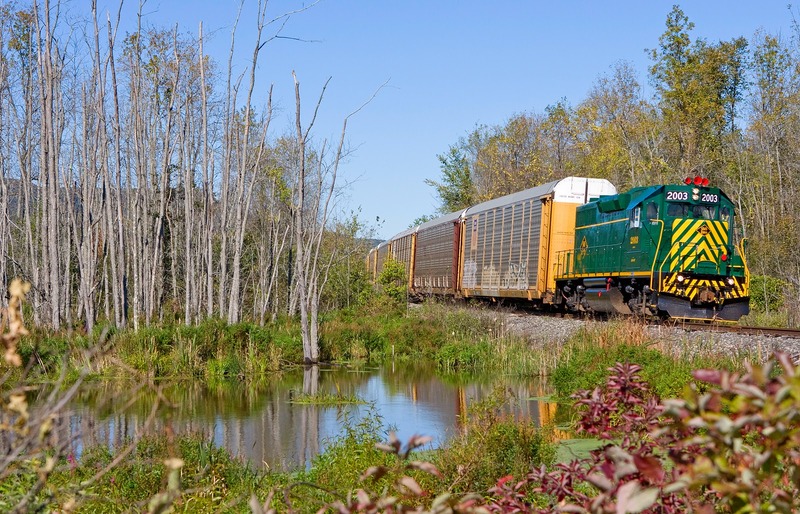 This is the elusive "peak" foliage trackside! Quickly setting up the lights, I apparently drew the attention of a neighbor across the tracks, who came out with a flashlight, then figuring out what I was up to, went back inside to watch. A test of the lights revealed the grand colors! 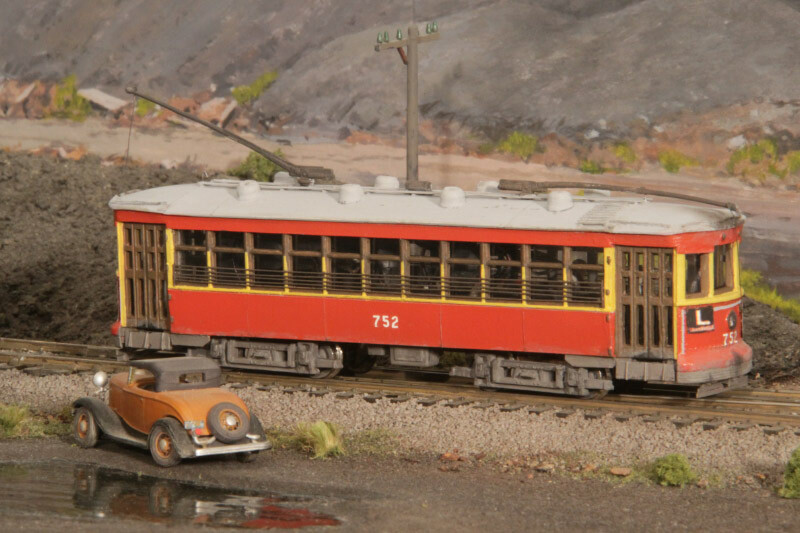 After some fine tuning of the setup, 642 was heard blowing for a nearby crossing north of me, coming off the scenic trackage above Lake Champlains Willsboro Bay we have visited before! Then it became time to enjoy the scene. The crew, after spotting my awareness flash as they approached, must have gotten a chuckle out of the situation, having been photographed by me earlier up at Plattsburgh, Ha,ha,ha! Amid the great sound effects of locomotives accelerating the heavy ethanol loads past me came the flash! The final photo of the night became the best! We will visit Plattsburgh later, (where I will give evidence in answer to the always pressing question: When are NS locomotives most attractive?) but I wanted to send out this shot first. I really like the contrast here between the unkempt old station, used as a storage area by M.O.W., and the peak foliage with white house across the tracks, with 9732 splitting the two extremes! Special thanks to veteran D&H engineer Marty Shapiro who brought 642 past the camera. SHot in Willsboro, NY on OCtober 20, 2010 at 04:58 with the 5D and Nikkor 14 - 24/2.8 lens set at 19mm and f2.8. Please enjoy! Comments are welcomed. The repair work from the plumbing disaster is coming along nicely.The two part liftout section is now in the Final foliage phase.The mountain from the bottom of the tunnel portal up is one section and the other is the river area under the mountain just to the left edge of the portal.Track will soon connect Hadley to the junction with the Adirondack branch at the tower. I love a rainy day, I had 2 soccer games (grand kids) scheduled for 4:15, both are cancelled. 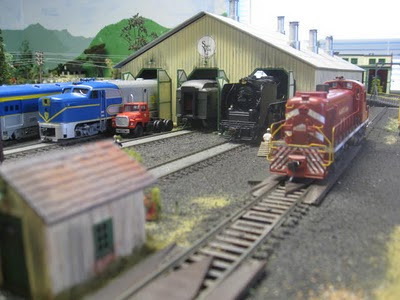 I have a perfect excuse to sneak into the play room and enjoy my hobby.No matter how hard it rains out, it always dry on the Skene Valley Railroad. Colonie Shop used to be where big things happened, now it's Skenesborough. (the Frazier is in the middle bay, she always gets a good cleaning and resupply after visiting other roads, so like her name sake, she is always ready for a road trip.) 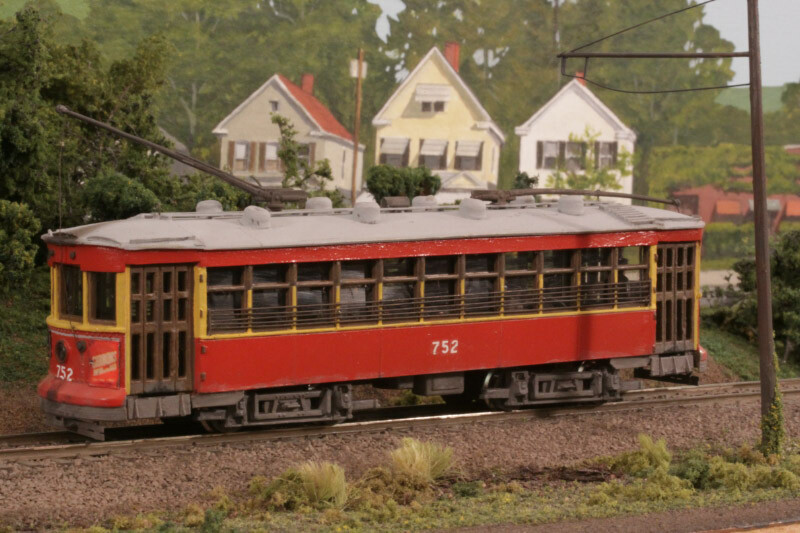 The (ex Reading) 302 is in the south bay while a pair of PAs sit on the north side. 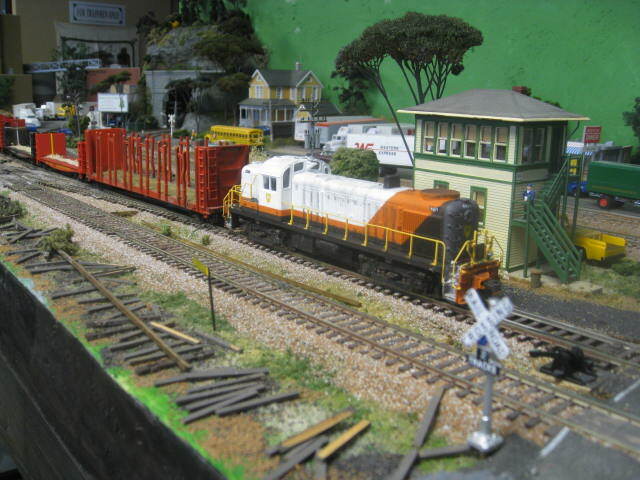 The 4078, still in VTR colors, sits on the Turntable lead. 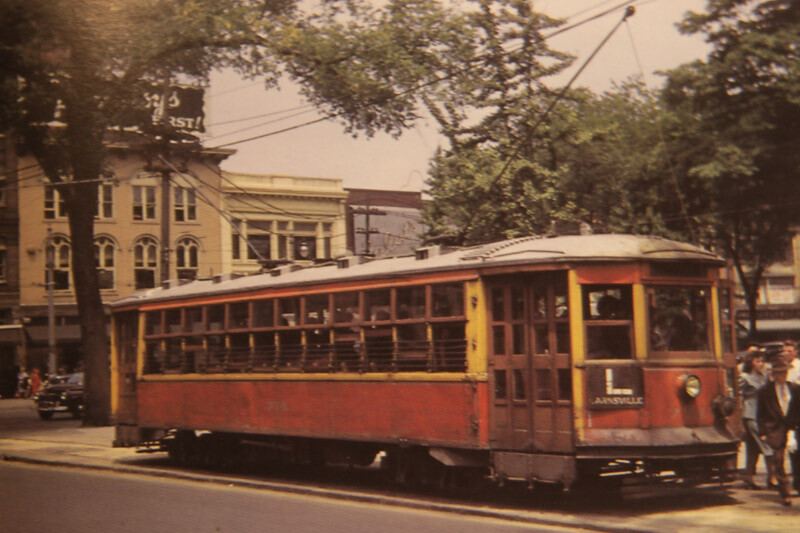 SVX-2 has backed the 4071, still in P&W colors, back over East Street while the crew sneaks across the street to the Silver Diner after having spotted some logs at the K-Mill. 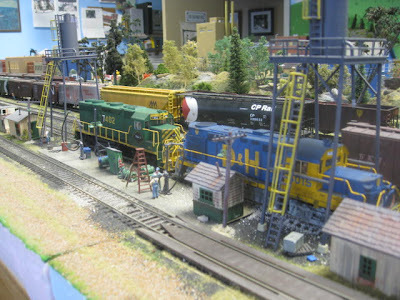 They sent the headman to Puck Catone's News Rooms to pick up the latest copy of Model Railroader, to see a little bit of Kip Grant's layout on page 80. Fueling at the shop. the 7402 is in Reading garb. One benefit of summer modeling and having your layout in your basement is the cool temperature there. In a quest to keep as much of my rolling stock as possible on-line I decided I needed more staging and dodge some heat. As some of you know, my layout is the tradional "dog-bone" design. Simply opening up the outer track would allow for access to new staging. Keeping the inside track of the dog-bone uncut allows for continuous running. (see photo 1). Photo 2 show the completed new staging yard. The 4 tracks on the left are Jersey City and the three on the right are Chicago. Finally the photo 3 shows the end of the dogbone and its original penetration into the laundry room. Please enjoy the attached photo. 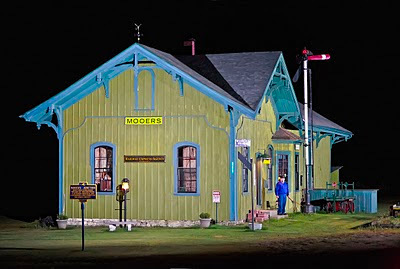 Here is another view of the restored ex-Rutland station in Mooers, NY. This view looks westward. The D&H crossed the Rutland here right behind the building. Owner-restorer Larry Marnes poses in the photo as operator! Great job on the building Larry! Shot in Mooers, NY on September 5, 2010 at 03:01 with the 5D and Zeiss ZF 35/2 (Nikon) lens set at f2. 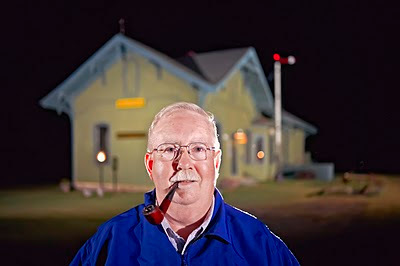 A proud restorer, Larry Marnes, (with assistance from Chris Trombley) poses in front of his accomplishment, the restored ex-Rutland Station in Mooers, NY! Put this spot on your list of places to visit folks! Congratulations to Larry for doing such a magnificent job! Shot on September 5, 2010 at 03:20 with the 5D and Zeiss ZF 35/2 (Nikon) lens set at f2. Please enjoy! Comments are welcomed. 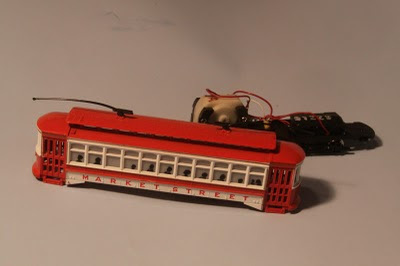 I know most of you won't have a particular interest in this project, either because it's so interest specific as to the prototype or because you're (damn you) too young to have a memory of these trolley's when they were running, I only have the barest memory of them myself. 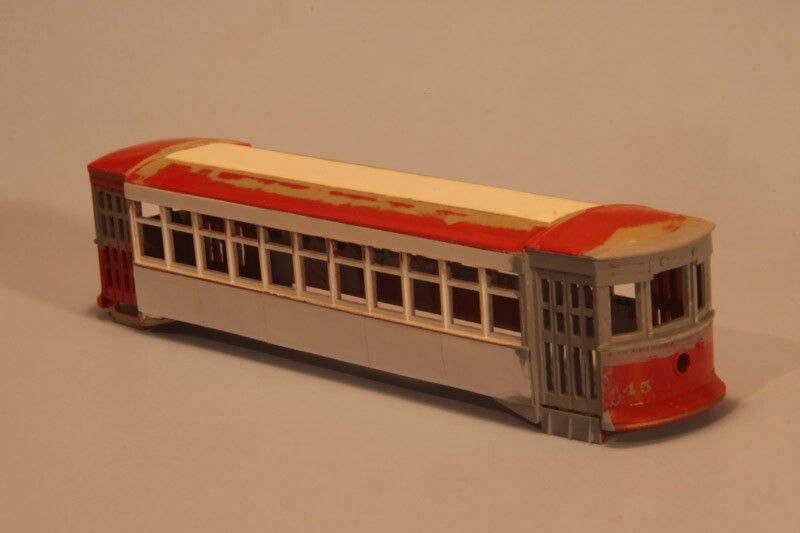 It took a few days longer than the two weeks I anticipated to finish the model and while I made a few consession to 100% total accuracy (doors too narrow, one window too many per side, are you a rivet counter?) I'm quite satisfied with the outcome. 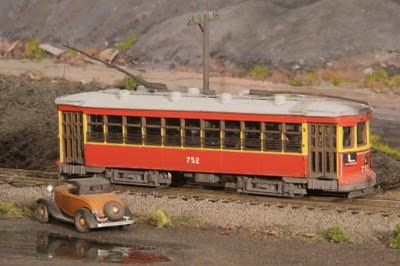 I sent a couple shots of the early beginnings of the project, photos of sister cars on the Wilkes-Barre to Larksville route and shots of the finished model on my layout. I've since found B&W's of 752 on the Larksville route by the Loree colliery and on the Grove & Brown, my old growing up neighborhood in Wilkes-Barre. I hope this latest strikes a chord with some of you. Comments and sharing with others is, as always, welcomed.